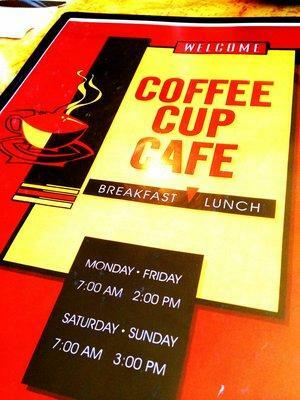 Pull up a chair to the counter at The Coffee Cup and unfold a menu of delicious diner classics and fresh new twists. This freshly renovated gem, nestled between old storefronts and car shops on East Fourth Street in Long Beach, is named for their famously delicious coffee that customers can pour themselves as they wait to be seated. Customers have a choice of regular or specialty flavors – such as hazelnut or even merlot wine. The front of the menu at The Coffee Cup Cafe. Most known for their breakfast, The Coffee Cup offers a full menu including various scrambles, pancakes and french toast plates, and meals that are “South of the Border” and “Out of the Ordinary,” as named on the menu. Having dined there twice, my personal favorite is the French Toast Combo. The french toast was fluffy and cooked perfectly, and the best part was the sweet and sticky blueberry maple syrup that I drenched my toast in. The eggs and bacon held their own too. The fried eggs were cooked to a yellow yolky delight, yet not too runny. The bacon was crisp, all that can be desired from a strip of meaty mightiness. For those of you with a more sophisticated palate, you might consider the Eggs Benedict. A rich plate of poached eggs on English muffins topped with cooked spinach and slices of raw tomato; it is a rich and filling brunch option. Personally finding the hollandaise sauce to be a little too heavy, I recommend ordering it on the side so that you can use as little or as much as you please. Service is friendly and always ready to top off your coffee. For the ultimate diner experience, I recommend sitting at the counter if you are not a large party. The wait to be seated is shorter and it’s fun to watch the waiters and waitresses zip out of the kitchen with armloads of food. I don’t mind bumping elbows and sharing syrup with counter neighbors if it means quicker service. It sounds all too mouth-wateringly good to be true, right? Well, the only catch is that you must pay in cash. No, The Coffee Cup does not succumb to the high technologies of debit and credit cards, so make sure you visit the ATM before stopping by.